Gas prices are expected to reach an all time high in 2012, and fleet managers are taking this increased cost very seriously. Being the second largest cost behind employee payroll, fleet fuel management has become absolutely essential and will make or break businesses in 2012. What can fleet managers do about this? Safety Track has pooled together resources from several areas to provide tactics that have successfully lowered fuel costs for fleets across the nation. Read through the tabs below to learn how to reduce fuel consumption and costs. Successfully monitoring fuel purchases and use is the first step in reducing fuel costs. Fleet managers must have the power to break down costs and use in order to know if the fuel reduction strategies they’re using are effective. Read on for successful strategies that have worked for fleet managers. Locating low gas prices has never been easier using Gasbuddy.com (also available as a free mobile application). Simply enter a zip code or nearby address gas prices will listed in order by location and price. Whether drivers check from their mobile phone, or dispatchers use this tool to route drivers, finding the lowest possible gas price is very feasible. Acquiring a fleet system with fuel card integration is the foremost way to monitor gas purchases. Not only does this organize your fuel reports, it also increases driver accountability. Even one driver adding or stealing $20 a week in fuel adds up to $1040 a year. 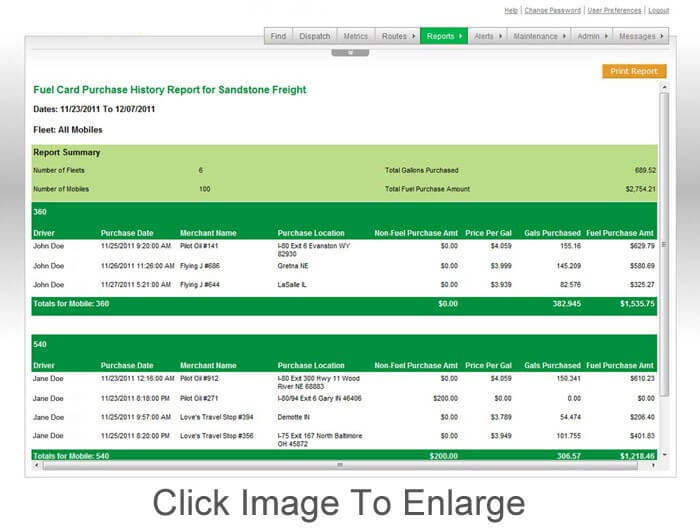 Fuel card integration with reporting options eliminates behaviors such as these very quickly. Idling times add up fast and it’s important employees turn off vehicles when they’re in park. Idling reports are a standard feature of Safety Track’s Fleet Tracking System. Generally, one hour of idling requires on gallon of gas. Download our free idling calculator or consult the chart below to determine the costs associate with a vehicle idling one hour each day. The most effective strategy for a fleet manager to lower their fuel expenses is to guide their employees driving behavior. According a study by Edmunds.com, a positive change in driving behavior can eliminate up to 37% of fuel consumption. Using a Fleet Management System, monitor driver’s MPG and provide incentives for the best MPG. Adhering to scheduled maintenance conserves fuel by keeping a vehicle running smoothly. Stay on top of each of your vehicle’s and never fall behind with GPS Fleet Tracking automated maintenance alerts. Alerts will automatically be sent to your phone or e-mail for any scheduled maintenance which can save up to 15% of fuel and completely organize your entire fleet to prolong vehicle life. Implementing a Fleet Management System enables users to keep track of all the metrics involved in reducing fuel costs. Saving up to 25% in overall fleet associated costs, these systems quickly pay for themselves while eliminating headaches for fleet managers.